I have written about the Great Wall before, but mostly in general. Today I am writing about one particular section of the wall – Badaling :八达岭长城. On my first visit to the Great Wall in 1999, this is the section I visited. I’ve been there four times altogether. But the real reason I was inspired to write about Badaling is that this is also the first section of the Wall my parents visited – in March 1983. 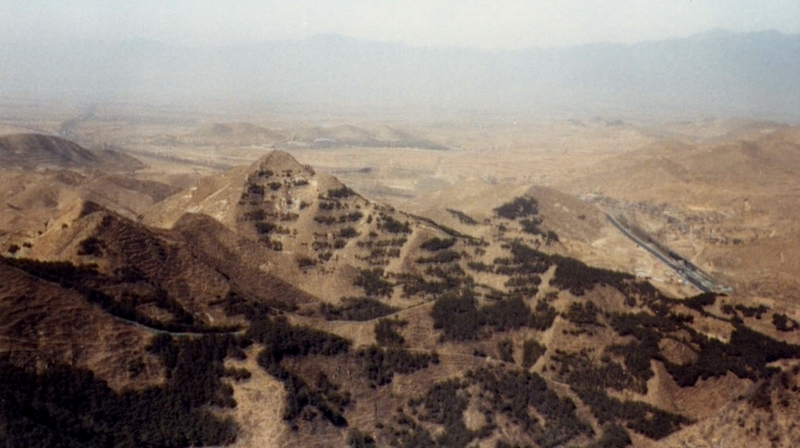 The view north from Badaling, take in March 1983. I remember this view, especially from my 1999 visit, when I looked at the smog beginning to fill the valley after the shutdown for the 50th Anniversary of the founding of the PRC. There were a LOT more buildings visible in 1999! The main entrance to Badaling is in a valley, and you can climb up the wall either direction – to the east or west. 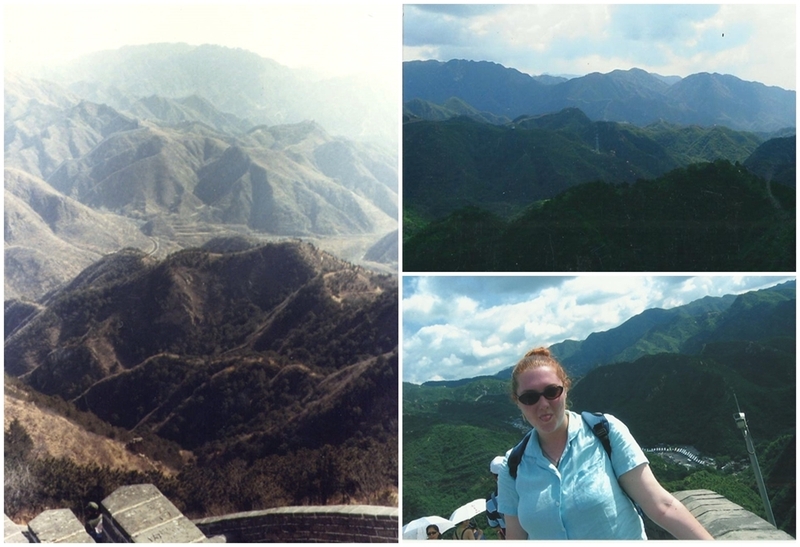 In 1983 my parents climbed the western side of Badaling. I climbed the western wall twice – with my friend Amanda in August 2004, and with my friend Esther in June 2012. Esther and I went late in the afternoon on a smoggy day so while we got some amazing photos, most of them aren’t much use for comparisons. Amanda and I visitied on a sunny summer day. My parents visited at the end of winter, when the vegetation was more brown, and the air only lightly smoggy. the contrast between the different photos is striking. Match 1983, August 2004, June 2012, March 1983. Badaling is the most visited part of the Great Wall, receiving millions of visitors every year. Its popularity is mostly due to location – about 80km (50mi) northwest of Beijing city. It was also the first section prepared for tourists, with the reconstructed section at Badaling opened to the public in 1957. Looking at the eastern wall from the western wall – March 1983 and August 2004. Badaling Great Wall was built in 1504 (Ming Dynasty) to protect the Juyongguan Pass about 20km to the south. The two sections are at the northern and southern ends of the Guan valley. The wall is an average of 8m high and 6m wide (wider at the base, slightly narrowe at the top). The highest section is 15m high. On top of the wall are crenellated battlements, adding another 2m of height. The wall was built wide enough for five horses, or ten soldiers, to move along side by side. Left: March 1983. Right: top – August 2004 (with me climbing – in heels and a skirt, of course! ); bottom: June 2012. Badaling is a “strong” section of the wall, meaning it has a lot of watchtowers. These two storey buildings had storerooms underneath and space for archers above. Badaling has one every few hundred meters. Beacon towers are similar, built on high peaks a few kilometres from each other, where signals could be passed along (with fire or smoke). 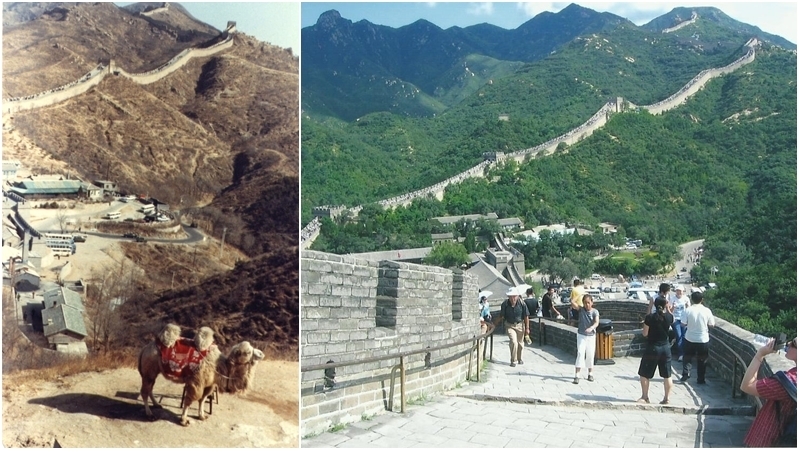 There are lots of forts along the wall; this one is near the entrance of Badaling (March 1983 and August 2004). The eastern side is where the cable cars go, and this is where I went on my first trip (with a sprained ankle!) I spent a while perched on the edge sketching while others in the group hiked. The strange sight of a tall, pale foreign girl sitting and sketching drew a lot of attention! I knew a crowd had gathered around me to watch but I didn’t realise how big the crowd was until my teacher came down to get me – she said the wall around me was nearly blocked off by 50 or so tourists crowded around me. Looking from the western wall to the eastern wall. Left: March 1983. Centre: August 2005. Right: March 1983 – with Mum climbing. I climbed the eastern side of the wall again in 2004 with school friends. There was a large group of tourists from an ethnic minority people group, all dressed beautifully in what appeared to be traditional outfits. The women wore heavily embroidered leg wraps, and headdresses with lots of fine dangling pieces that clinked lightly as they moved. Several of my friends asked some of the women if they would mind posing for a photo with them, which they graciously did. About 45 minutes later my friends and I were sitting for a rest high up the eastern wall, when several Chinese businessmen stopped and asked me to pose in a photo with them. This used to happen a lot (especially at tourist spots) so I just smiled for the photo and they were on their way. My (Indonesian) friends, however, were quite unimpressed. They didn’t like that these strangers had imposed on me – and why would they want that photo anyway? I was stunned. Hadn’t they done the exact same thing not long before?? But to them, my white skin and blonde hair and blue eyes were not strange, not so noteworthy that they required photographic documentation. I wasn’t exotic or unusual in the way those women in their traditional outfits were. But to people who have never had a foreign friend, perhaps never seen white skin in real life, I am different enough to be worth asking a stranger for a photo. Left: March 1983. Right: August 2004. 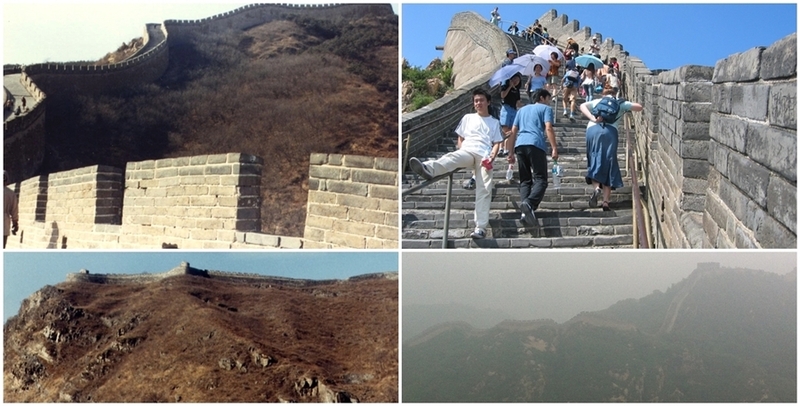 Badaling is now more accessible than ever. Amanda and I joined a local tour bus in 2004 (the poor tour guide was petrified that we didn’t understand the instructions and would get lost or not come back to the bus on time!) 8 years later Esther and I were able to take a train, with a much more flexible schedule. The train from Beijing North station is right at the Xizhimen subway station and I could use my transit card to swipe on and off. So convenient! Many foreigners look down on Badaling a little – it’s seen as the touristy spot on the wall, and many of us prefer Mutianyu, or less crowded spots we like to visit instead. While Badaling IS more touristy and crowded a lot of the time, it’s still a lovely spot with amazing views.